Natalie has a craving for some berries and heads out to her favorite spot to pick them. 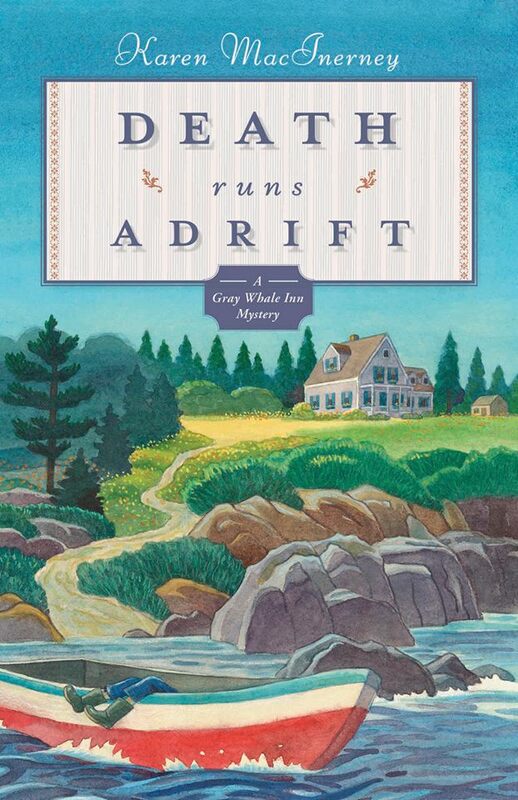 Little did she know that on her way back to the inn she would find a dead body is a dinghy adrift in the water. Several suspects come to mind including someone that she knows is innocent. Could it have been a lover’s quarrel or a disagreement over lobster territory? Natalie thought she would be putting the finished touches on her wedding plans and instead she is trying to catch a killer. As I read this sixth installment I felt like I was visiting old friends. Natalie and John are planning a destination wedding. Gwen is away at college. John’s mother is staying in the guest house and helping out at the inn. She also has a boyfriend that really adds to the fun. There are two guests currently at the inn, a mystery writer and a woman investigating a long last relative that may have had ties to Cranberry Island. The deceased seemed to have worked for a lot of different people on the island and may have been stepping another man’s toes with the lady he was dating. The plot started out slow but it wasn’t long and those pages were quickly flying. As more clues emerged the real culprit floated right up to the surface. This turned into a very complex mystery that had police stumped until Natalie with a bit of help pulled everything together. Karen MacInerney has written quite a tale. We see things are not always idyllic living on an island. In addition to the main murder storyline we learn that the island school may close and that would be devastating to those families that live year round on the island. Natalie and John also receive some bad news and then we can see the way their island friends rally together. Critically acclaimed author Karen MacInerney also teaches writers’ workshops and drives a mean carpool. Her book Murder on the Rocks was selected as an Agatha nominee for Best First Novel. When she’s not writing or chauffeuring children, she loves to read, drink coffee, attempt unusual recipes, and hit the local hike-and-bike trail. She lives in Austin, Texas, with her husband and two children, and escapes to Maine as often as possible. Sounds like another good one to put on my t-b-r list. I really enjoyed this one – thanks for letting me do the tour! I like this series and this story. I also like her urban fantasy series which ended before it’s time. Another great cozy for reading by the pool. I’m stockpiling them!